On Thursday, I went to get more vaccines. More Hepatitis B along with Hepatitis A and Typhoid. Typhoid’s a killer. It leaves your arm heavy and sore and ‘flu symptoms for a few days. Better than the actual thing, though, right? Anyway, I’d left the house early because I had another appointment before the vaccines but when I was waiting for the bus, they called and had to postpone until next week. The net result of this was that I found myself in Hodges and Figgis, absorbed in a book called Couture Sewing Techniques, when I probably should have been looking for shoes to wear with my wedding dress. It’s a great book with high detail and many photographs showing the difference between the couture method and the usual method. Of course, I had to go and find the section detailing checks and plaids and how to insert darts without upsetting the pattern at all. So, when I sat down to sew my darts this morning I realised that what has been seen, cannot be unseen! I sewed one the usual way without much consideration for the pattern… until I pressed it out and there they were, staring up at me from the irioning board. Many, many slightly unmatched lines. I went no further. I ripped out the machine stitches and got out my needle and thread. I tacked it by hand. And re-tacked it. And again. And again. Eventually, it was right. I did the same with the other three pieces. Thanks to my completely paranoid cutting last night, the other pieces were easy to match up and I only had to tack them once to get them right. It might sound terribly dull to you but I think it was worth it. After all, what’s the point of using such a patterned fabric if the lines don’t match up? Putting on the back pockets was easier. I pressed all the seams and tacked down all the corners because they kept poking up and generally being bold. I had a problem with the seam allowance at the top because it kept poking up over the top. 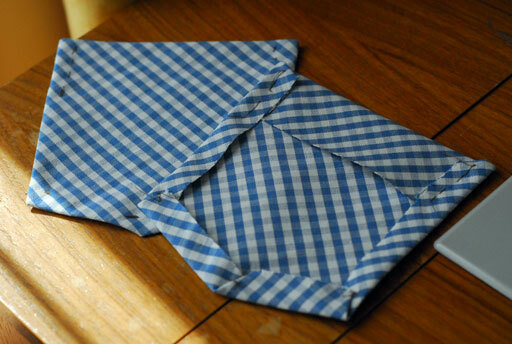 So I folded it in, like an origami valley fold and tacked it down. It worked really well. Then I pinned them onto my two back pieces. I didn’t like the alignment specified in the pattern (which I used when I made the muslin sample) so I adjusted it a bit and tacked them in place. I figured I should see how they lined up when the two pieces are together so I pinned them and had a look. One was completely wrong so I was able to whip out the tacking and reposition it. Then I topstitched them in place. And that’s more than enough lines I can take for one day! I thought I was going to go blind lining up the pattern pieces and cutting it out! All in a good cause though I think. I have got that song stuck in my head today. Don’t worry, it could be worse – I had ‘I’m a little teapot’ but to the tune of ‘I’m a lumberjack’ stuck in my head for two whole days last week. I blame the vaccines and the thesis. I’m on round three of vaccines this week and slowly but surely grinding out a ten thousand word essay. People complain about theses. Don’t get me wrong. I do too, but it’s more out of personal dissatisfaction at meeting a daily target than an issue with my topic. I have had two years to write it and here I am, just like I suspected, banging it out in the two weeks before I get married. The few I have admitted this to sigh and tut. To them I say, show me proof that two years of agony over four weeks of concentration makes a better thesis! All going to plan, by the time it is submitted, I will be supine in the shade somewhere watching ghostly waiters eagerly float to bring me an iced drink and not thinking about whether or not my conclusion concludes. Who wants to read a thesis about a thesis anyway? 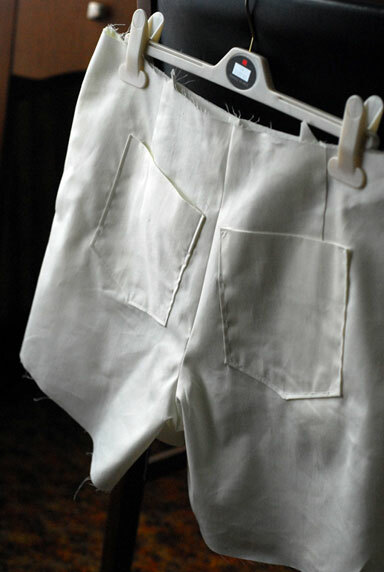 Here’s a mock-up of a pair of shorts I am planning on bringing to show the waiters. Yet another pattern from the June issue of Burda. Pattern number 111, I believe. I figured it would be a good introduction into the sewing of pants, since, like a sweater, it’s the fit of the yoke that matters the most. I added an extra centimetre onto the side seams because I wasn’t sure of how much ease had been added in, but it looks like I won’t need it. Otherwise, they fit well. They have a side zip so I don’t even have to bother with a placket at the front or anything. 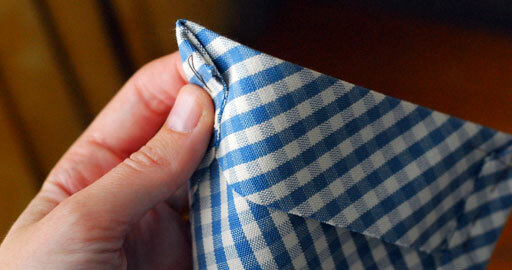 There are pockets, too. I did think about leaving them out but I just know it would drive me crazy. 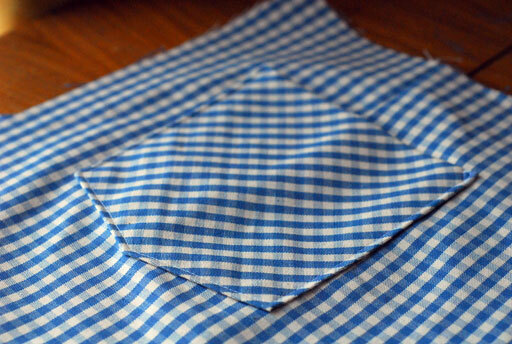 I do like pockets. This is my third time putting in pockets and it definitely gets easier each time. 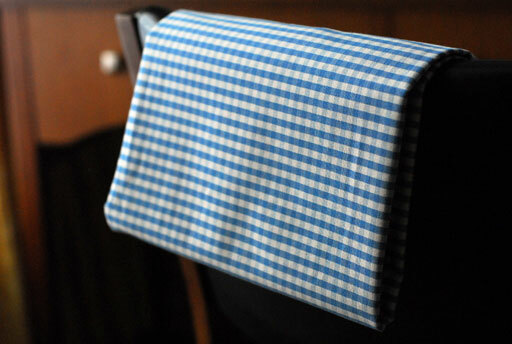 The challenge with this project will definitely be the fabric. 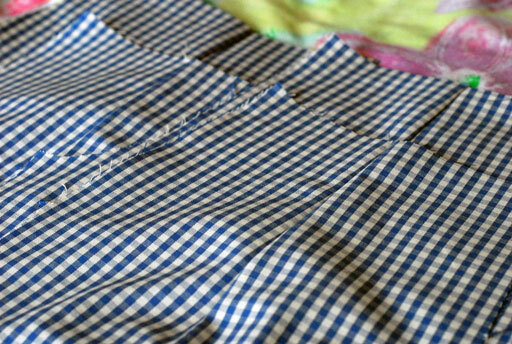 I went into Murphy Sheehy’s and said, I want a plaid or a check to make some summer shorts. She produced this. 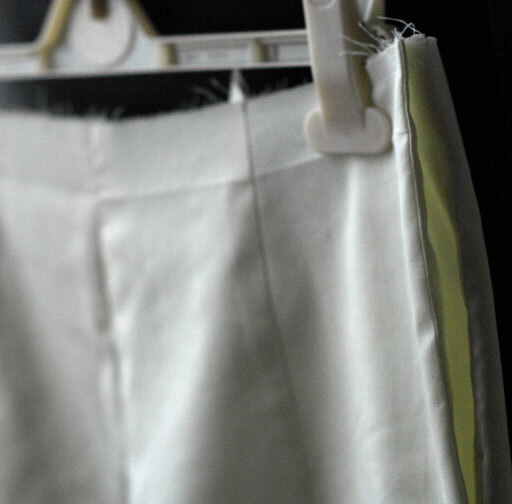 It’s actually some sort of kitchen curtain material but it’s the perfect weight for shorts. Really, all I hear when I look at the fabric is the chink-chink of ice in a glass. Fingers crossed it all lines up.